Earth-based spirituality, woodturning, crafts and life in the Adirondack mountains. Since I find myself calling on Hestia often, I have created a small altar in our kitchen, near the stove, in her honor. Altars do not have to be elaborate and, especially for a domestic goddess like Hestia, can hold common household items. If you use everyday items, however, they should be cleansed before being used on the altar. In addition to a mundane cleaning, I pass my things through the smoke of a sage smudge stick. My altar for Hestia is on a small shelf next to my stove. 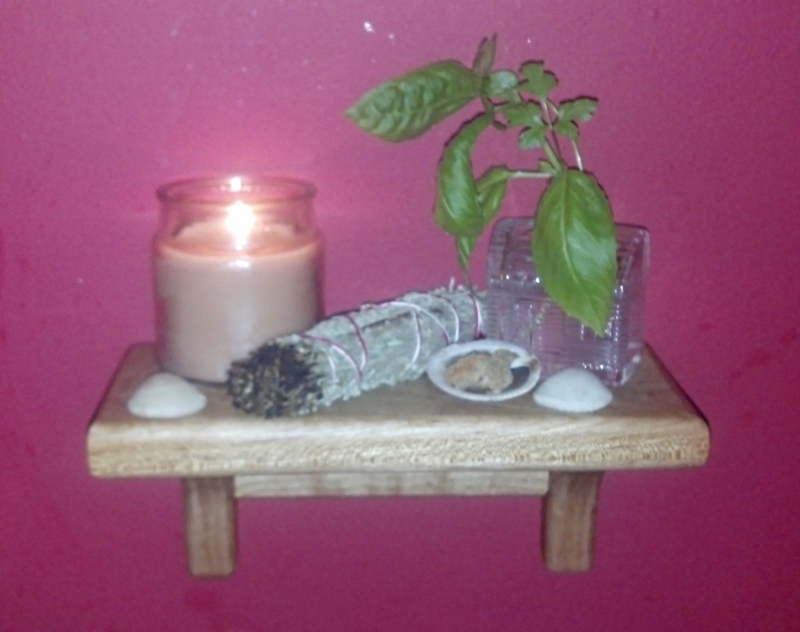 It holds a candle, a sprig of basil, a sage smudge stick and some shells. The anchor of any altar to Hestia should be a candle or an oil lamp, representing her sacred hearth fire. A small dish can hold an offering from the oven, like a small piece of fresh bread. I use a shell instead of a dish; it is a nod to Hestia’s association with the energy of water. A cauldron or bowl would also be appropriate to pull in the water aspect. Hestia’s herbs include most of the cooking herbs, such as basil, mint, sage, rosemary, parsley, thyme and dill. Sprigs of herbs, fresh or dried, could be arranged in a small vase. A tiny cabin-shaped bottle left over from some local maple syrup we were given does the job on my altar. If you would like to add stones or metals, Hestia’s crystals are garnet and amethyst, and she can be honored with gold, silver or brass. An antique silver spoon would be perfect. A statue of your chosen deity is nice to have, but I am not a visual person, therefore I find that simple items that bring to mind Hestia’s energy are more beneficial than seeing what she might have looked like. I penned this simple prayer to Hestia to say as I greet the altar each morning. May Hestia bless your home, as she does mine. Every hug is a hymn to you. fill this home with your warmth. Every meal is an offering to you. in our home, honored first and last. Hestia, every flame is a prayer to you. This entry was posted in Goddesses and Gods and tagged Altar, domestic chores, Greek gods, Hearth, Herb, Hestia, invocation, Olympians, sacred space. Bookmark the permalink. The offering looks quite lovely. I hope she brings you many blessings.